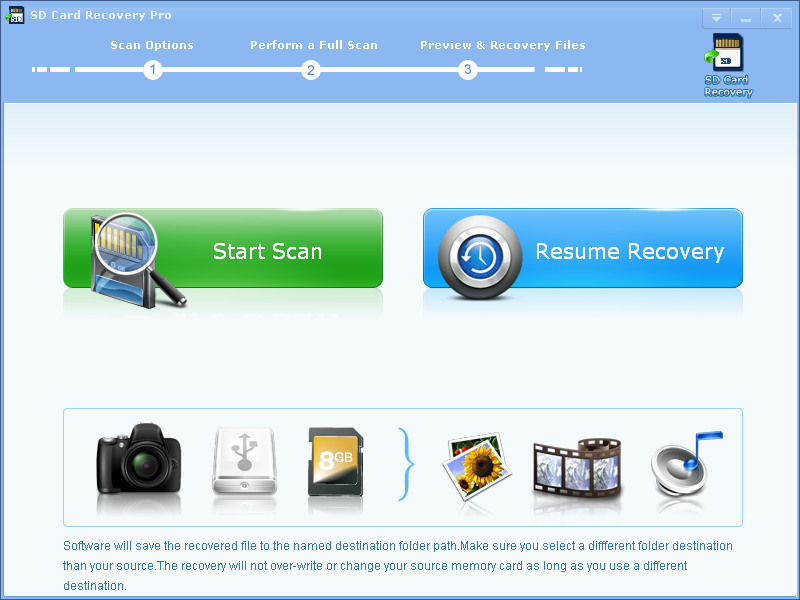 SD Card Recovery pro is ranked in the top as it is a leading SD card recovery software for many kinds of memory cards. For example: SD card, miniSD, SDHC, MicroSD (TransFlash) card, Compact Flash card, CF Type I, Type II, MicroDrive, CF card, Memory Stick, Memory Stick Pro, Duo, Pro-HG, XC, Micro (M2), MultiMedia card, MMC card, SmartMedia, flash card, xD Picture card, ect. As it has several years' history on recovering and retrieving SD card, many people rely on it very much and it is and will be their first and best choice. Some people recommend this magic SD card recovery software to the people around them. As it can efficiently and effectively recover lost, deleted, corrupted or formatted photos and video files from various SD cards. SD Card Recovery pro can undelete all daily files, data, but also images, pictures, music, audios and videos with almost all kinds of formats: PNG, TIFF, INDD, JP2, PSD, Paint Shop Pro Image File (PSP) for picture; M4P, RPS, AIFF, MIDI, M4A, AU, OGG, WMA, RM, Real Audio (RA) for audios; DV, M4V, 3G2, M4B, AVCHD Video File (MTS), Divx Encoded Movie File (DIVX), Matroska Video File (MKV), MOI Video File, OGG Media Player (OGM), Video Object File (VOB), 3G2, ASX for videos. Most people choose SD Card Recovery pro to recover their lost things as the SD card recovery software can retrieve data, there is no need to say, but one of the additional reason is it is easy-to-use and totally risk-free. The young and old can also operate it without any problem. This card recovery software enables the quick recovery of photos from different storage devices in just three steps. To sum up: 1.Connect SC Card to Your Computer. 2. Perform a Full Scan. 3. Recover Lost SD Card. Another reason is because its high quality of refund policy. If you don't content of SD Card Recovery pro , you have 60 days money back guarantee. Good service is another characteristic. just have a try. 2013-03-18 2.8.0 New feature preivew thumbnails of picture.